I recently read an article which stated that the incandescent light bulb, you know, the one Thomas Edison came up with in 1880, is being phased out starting next year. 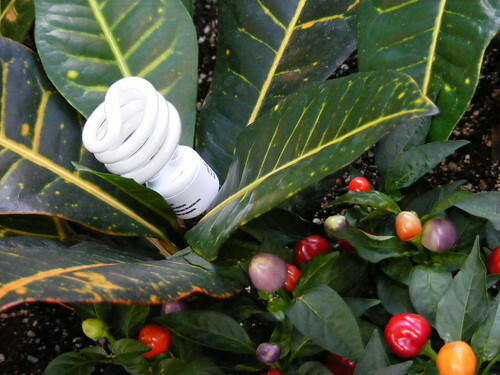 By 2014, only a few specialty incandescents will be available like three way bulbs and lights for plants and appliances. No more simple incandescent bulbs that cast that warm, cozy glow over the pages of your book as you curl up reading each evening in your favorite chair! The incandescent bulb is being slowly but surely rooted out by the cold, impersonal light of the compact fluorescent light bulbs (CFLs). There is another option, called the LED bulbs, but as of this writing are virtually unknown in American stores. So, at least for now, this leaves us with the CFLs. My main beef with the CFLs is not the Antarctic light they cast. While I don’t like CFL light nearly as much as the warm glow of incandescents, I could probably get used to it after awhile. I’ve also noticed some of the newer CFL bulbs cast a much warmer glow than a few years ago. My issue is with the small amount of mercury present in each CFL bulb not to mention the amount of dirty electricity your family is exposed to when you use fluorescent bulbs around your home. Supporters of CFLs say that the small amount of mercury in the bulbs is less than the mercury emissions from coal fired power plants and CFLs use a lot less electricity than incandescents thereby significantly reducing those emissions. My take is that mercury is a neurotoxin and is not safe in any amount, certainly not in your home. What if that adventurous toddler knocks over a lamp and breaks one on your living room carpet? The result is not just a pile of broken glass like what would happen with an incandescent bulb. The result is exposure to a potent neurotoxin. I don’t personally derive any level of comfort from claims that the small amount of mercury from a broken CFL would not contaminate a home or require an environmental crew to clean up the mess. The FDA makes similar claims about dental amalgams too, but the fact is that people are experiencing toxic effects from them just the same. Another worrisome problem is that most people throw CFLs in the trash rather than recycle them despite laws against this in many areas of the country. Not only does this potentially expose sanitation workers to high levels of mercury from multiple broken bulbs but it has the likelihood of turning our landfills into toxic waste dumps. What’s more, CFLs that break near homes can contaminate the soil. Adding to the problem is the lack of participation by big retailers such as Wal-Mart in assisting with the recycling effort. Even General Electric, which has manufactured CFLs for about 20 years, says the small amount of mercury in each CFL bulb could add up to big contamination problems once incandescents are no longer available and sales of the toxic bulbs rapidly increase as expected starting in 2012. Incandescents still represent about 80% of the market for bulbs in America with CFL bulbs accounting for only 17% of sales. It seems to me that the switch from incandescent bulbs to CFLs represents a classic case of robbing Peter to pay Paul. I, for one, will not be embracing the CFL trend. I’ve got quite a stash of incandescents that should last me a good long while and when those run out, hopefully this new LED bulb technology will offer a decent non-toxic solution for my home. Would Any Real Food Still Left in Restaurants Please Stand Up?